As I've mentioned before, I turn most of the soy milk I make into tofu, because while I like soy milk well enough, I just love good, fresh, creamy tofu. Yes it is bland, but there is beauty in that blandness. I love the beany taste of tofu that totally lacks the rather grassy taste of that is prevalent in soy milk. A word of warning before you proceed. For some reason, tofu comes out a bit different every time I make it. Sometimes it's rather grainy, sometimes the curds are big and creamy. Sometimes the tofu is sort of hard and small, other times it's moist. Occasionally the tofu simply falls apart. I think this has to do with the beans, the temperature of the soy milk, and so on. I'm still trying to figure out what exactly causes the differences. Whatever the outcome though, homemade tofu is still really delicious, so don't be afraid of giving this a try. Here's where it starts to get scientific! Nigari a.k.a. bitter salt is the tofu coagulant that is most commonly used in Japan; it's magnesium chloride with other trace minerals. Another coagulant is gypsum or calcium sulfate, which is more commonly used in China. You can get pure magnesium chloride or calcium sulfate from health food stores or pharmacies, and nigari is available from some health food stores or by mail order. Recently nigari has been touted as a health and weight loss supplement (don't ask me why, or whether the claims made are true). However, I have found that the nigari sold as a health supplement doesn't seem to have the same coagulating potency as the nigari sold specifically for making tofu. So for foolproof tofu, buy nigari from tofu and soy milk making oriented sources. Nigari is available either in concentrated liquid form, or more commonly in powdered or flaked form. I'll give instructions for making tofu with powdered nigari, which is easy to handle. But previously I have used a plastic Tupperware-type storage box with holes poked through the sides and the bottom with a drill. That worked just as well. For the amount of soy milk in the recipe following, a box that is about 15cm wide x 20cm long x 15 cm deep (6 inches x 8 inches x 6 inches) is ideal. You can also purchase square tofu molds from mailorder sources. Incidentally, you may see instructions on some sites for making a wooden tofu mold. If you decide to do this, be very careful what kind of wood you use, and what kind of screws. Remember that the mold will be totally soaked, so if you're not careful the screws will turn rusty or the wood will warp - and if it's not dried enough between uses it may even start sprouting the kind of "mold" we don't want. Generally I much prefer easy-to-clean plastic or stainless steel molds. If you aren't concerned with making your tofu square - for instance if you primarily use your tofu mashed up into other ingredients - you can use any container with drainage holes in it. I've made little round ones in tea strainers for example. 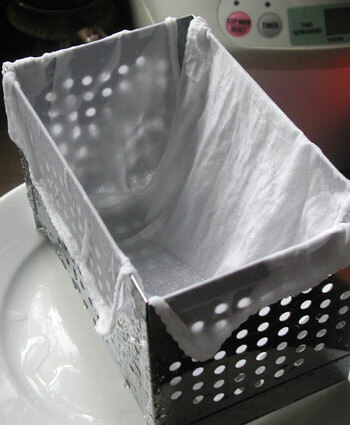 A smallish fine-mesh sieve lined with a cotton cloth works very well. This is to line your mold with. For my square stainless steel mold I have two long, narrow strips of cotton; one is about the width of the narrow end of the rectangle, and the other the width of the wide end. 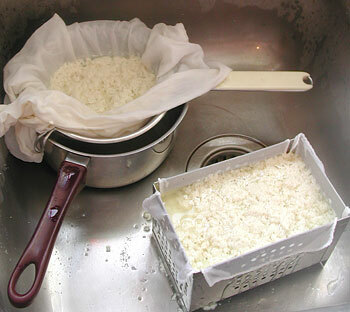 For making tofu in a small sieve, I just use a plain cotton handkerchief. The ideal temperature of the soy milk for making tofu seems to be around 75°C / 165°F. If you want to have more control over the results, use a food thermometer to measure the temperature. You may have seen two types of tofu in stores: momen, or firm, and kinugoshi, or silken. Momen means a type of cotton, and kinu is the word for silk; kinugoshi means "strained through silk". In actuality, the difference between the two types is how much the water is drained from the tofu. Kinugoshi is softer because it has more water in it. However, obtaining that smooth, silky texture is rather difficult at home, so my instructions are for making momen type (firm) tofu. Follow the instructions for making soy milk, but instead of putting the strained milk someplace where it can cool down, put it back into a clean pot on the stove on the lowest heat. It should not boil, but just stay hot. If you are using previously made soy milk, heat it up so that it's hot but not boiling. Use a thermometer if you want to be precise - it should be around 75°C / 165°F. The reason you don't want to add all the nigari at once is because it has a slightly bitter taste, so you want to add a little as possible while still achieving a good degree of coagulation. Most of the time though, the entire amount can be added. Turn off the heat, and put a tight fitting lid on the pot. 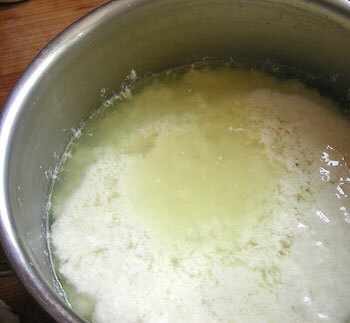 Leave for at least 15 minutes, then take a look, stirring very gently to see the state of the curds. They should be fairly big and totally separated from the yellowish liquid. If the white particles are still very small and floating all around in the liquid, add the rest of the nigari liquid if you have some left, or make up an additional teaspoonful's worth of powder and water. Stir in, and put the lid back on for an additional 10-15 minutes. In the meantime, prepare your mold by lining them with clean white cloths that have been moistened with water and then wrung out. Here I have lined my square mold with the two narrow strips of cloth described in the Equipment section. Look in the tofu pot again. 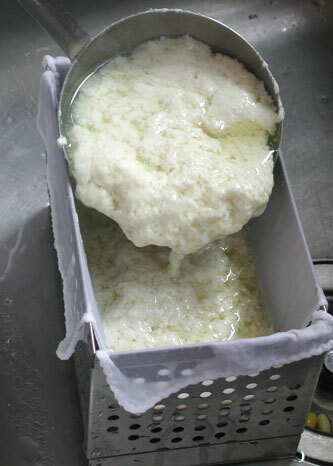 The white curd will have settled on the bottom and all you will see is yellowish liquid. I like to scoop most of this off first. Sink a small sieve into the pot to prevent yourself from scooping up the tofu curds, and ladle out the liquid. In the photo below I've shown an alternate "mold" you can use, if you don't have a square one. 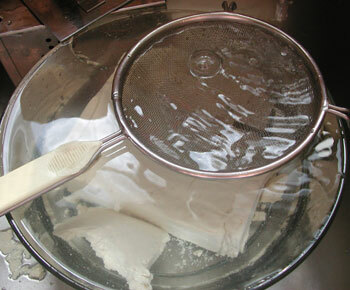 It's a small sieve (the same one I used for scooping out the liquid actually), lined with a large cotton napkin. You'll get a round shaped tofu of course, but it will taste the same as a square one! Keep filling the mold you may need to wait for some of the liquid to drain out a bit before adding more. Once you fill up the mold, the resulting tofu will be about half the size of the mold once it's been pressed. Once you've added all the curd, fold the cloth over to cover. Then, put some kind of weight on top, to help to press out the liquid. My mold had a lid of sorts which has some weight, plus I can press down gently on the handle. 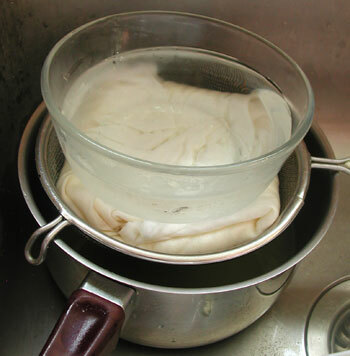 For my improvised round sieve/mold, I've put a bowl filled with some water on top of the cloth-covered tofu. The weight of the bowl will help to press out the water. Leave the tofu like this for a while, at least 15 minutes or so. You can very gently press down if you like, but generally time and gravity will do its work for you. Take the lid or weight off and gently poke the tofu. It should feel firm enough to hold together. Fill a large bowl with water, and put your mold into it, Invert gently so that the tofu falls out. Carefully peel off the cloth. There's your tofu! The final step is to de-bitter the tofu. As I've mentioned above nigari has a bitter taste, and you want to wash this out. (The bitterness is very subtle, so try tasting a bit of the drained tofu first. If you don't detect any bitterness you can skip this step.) The easiest way to de-bitter tofu is under running water. Put a sieve (I've used that same trusty little one again) over the bowl holding the tofu, and run a slow stream of tap water over it. 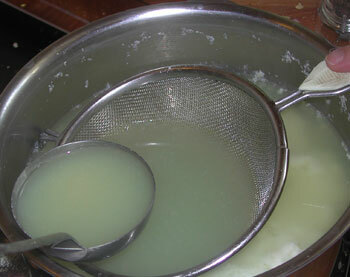 The sieve will break up the water enough so that it doesn't cause the tofu to crumble. Leave like this for about 20-30 minutes. You can see some odd looking scraggly pieces of tofu in the picture. 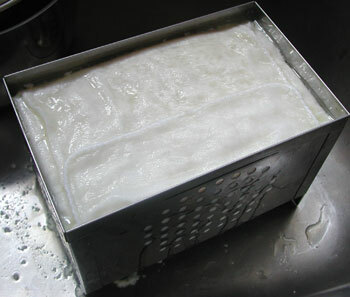 That's what came out of the sieve-mold, because I put most of the curd into my square mold. If I had put all the curd into the sieve I would have gotten a round tofu. The point here is, if you end up with bits and pieces of tofu, don't despair and throw them out - they're still useful! Finally, it's time to store your tofu. Tofu tastes best a few hours after it's been made. If you make your tofu on a Saturday morning, it will be at peak eating for dinner. Take it out of the water carefully. Here is my gorgeous tofu nestled in an Ikea plastic container. If you intend to eat the tofu on the same day (and, why wouldn't you want to?) don't put any water in the container. Put on an airtight lid, and store in the refrigerator until ready to eat. If you will keep the tofu for more than a day, put in enough water to cover the tofu. However, home made tofu should not be kept more than a couple of days - remember this is totally preservative-free. So there you have it: homemade tofu. I've tried to explain every step of the process so it may look complicated, but it really isn't. From start to finish, making tofu requires about 90 minutes, though much of that time is waiting for things to happen. If you're making soy milk on the same day, add another hour. This is a great weekend-morning type of project. You'll get rather wet and messy, so put on a big apron or old clothes and have fun! 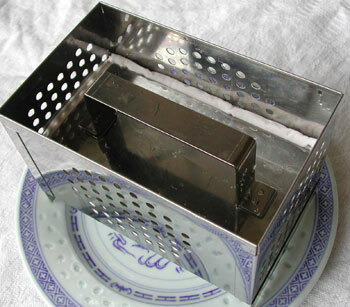 Just Hungry reader Bharati found a very similar tofu press to the one I have for sale and kindly shared the information. It's made of stainless steel, and according to the description it can make a block of tofu that's the size of about 2 blocks of commercially made tofu at once. The mold comes with a cloth liner and a strainer bag. Here it is on the Rakuten shopping site; and here it is on Amazon Japan. One final note: This page, more than any other on this site, has been plagiarized by several unscrupulous sites. This is the original page, produced by hours and hours of experimentation on my part. Accept no substitutes! Submitted by maki on 2006-03-24 18:47. Thanks, again. This looks absolutely do-able. I think I'd be more inclined to cook with tofu if I had it made fresh. Hi! This is quite interesting post about soya milk and tofu making. Very impressive! WOuld love yo try since I love soya milk and tofu. Question for you - do you use white kidney beans or the small white beans? You know of any website I could order one of those tofu mold you've got? Would love to order them if I could. Thanks a lot! Elna, I use dried soy beans, not kidney beans...which are a totally different kind of bean. I don't know where to order that actual mold online, unfortunately... though a plastic box with holes punched in it is a good mold too. Just beautiful!!!!! Yours look so nice. Was funny to read that you started the same way as I did by drilling holes in a plastic container to make a tofu mold. I've tried making tofu twice and can't get it to be soft and creamy. Mine turns out more on the chunky side. Am I adding too much pressure on the mold to form the tofu? I tried cutting down the amount of nigari, but it stayed in the liquid form. I was thinking of using agar agar instead of nigari to get the soft smooth creamy tofu. What you think? Lance, I think the key is the pressure. I don't press down on it too much but just let gravity do the job. I take it out of the mold when it's about half the volume it started out with. Later on if I want a firmer tofu (for stir-fry or something) I wrap it in a cloth or paper towels and press it some more, but for just eating I prefer it to be pretty soft. Since agar-agar is like gelatin I don't think it would work too well as a coagulant..and the texture would be totally different. But if you give it a try please let me know how it turned out! Thanks Maki. I guess I was afraid that if I didn't press down hard enough or leave it draining long enough (about 20 minutes), it would fall apart. As I don't see how all those little pieces stick together. I usually put about a 2 liter container full of water on top as a weight. I guess that's a little too heavy, as it ends up about 1/3 the volume from what I started with. I will try it again with a lighter weight. I think you're right about using the agar agar powder, instead of a coagulant. I guess it would be more like a gelatin dessert instead of tofu. Texture would be completely different, like a tofu flavored jello. Thanks for your insight. Woa, it comes out perfectly! That is a very interesting project. Lemme see if I can find the tools over here in Canada. THANX! PUNCTUAL AND COMPLETE! SO GREAT! HELLO MUSICIANS/VEGETARIANS FROM URAINE!!! Please let me know where you bought/ordered a stainless steel mold for tofu making. Hi, I am having trouble finding a source of natural nigari. I was advised to use epsom salts but it didn`t come out too nice. Not a nice taste. Any ideas? I use vinegar to make tofu, don't put too much. Put 2 tablespoon first,stir then lid on about 4 minutes. Keep doing( 2tbsp vinegar then stir then lid on) until you see the curd. what does that do to the taste? thanks i was confused about nigari and all others but your suggestion of usage of vinegar helped a lot. $5-6 seems like a ripoff since the dry stuff goes a lot further. Epsom salts do make terrible tofu, but I assure you that with real nigari, it turns out really great. hi, i'm a bit late. . .6 years ha ha. . I'm trying to make tofu and HAVE the flake nigari. . but there were no instructions on how to use it. .I've done 2 batches of tofu and both have failed.. one never solidified and the other. .hum lumpy at best. . .I'm now trying mini portions so how much of the flake nigari is needed if I make 1 cup dry (3+ cup when hydrated)soy beans? Yir, try using 1/4 tsp of flake nigari dissolved in 1/2 cup water when using milk made from 1 cup dry beans. Stir it in slowly, letting it settle a bit between additions. You probably will notice it curdling before using all of the nigari. Just throw the rest away. Best not to use too much if you can help it! Wow! My girlfriend and I made some tofu last night. What an awesome adventure. We went the easy route and bought soy milk at May Wah market on clement street in san francisco. May wah also has "gypsum" however it was re-labled "dried borax" and was from the PRC. Im a little scared by re-labled stuff coming from the PRC. scary. So we got the nigari at Japan town's nijiyama market. I accidently over heated the milk to 190 F, but the tofu came together just fine. A little bitter at first (to much nigari, yuck!) but after some washing we were set. Thanks so much for the great write up. Hi Mikey, think U were wise not to use the 'borax' item. http://en.wikipedia.org/wiki/Borax : " Toxicity: Borax, sodium tetraborate decahydrate, is not acutely toxic. Its LD50 (median lethal dose) score is tested at 2.66 g/kg in rats. This does not mean that it is safe, merely that a significant dose of the chemical is needed to cause severe symptoms or death. " Mikey, sounds like you and your girlfriend had a great time! I'm glad my article helped! so where do you purchase this sieve. I need to make a dessert that calls for one. Thank you, Makiko! We made tofu today - from start to finish, starting with your soymilk recipe and finishing with your tofu recipe. We used 20 oz soybeans (what we had on-hand) instead of 16, and ended up using 2 Tbsp epsom salts for the whole batch. It is not at all bitter, so perhaps Orion and Myriam (above) should try it again? The Okara has gone into the vegetable drier, on screens, to be incorporated into quickbreads as you suggest. I don't think I'm going to eat any food you have to curdle with something that sound like it comes from a chemistry lab. just because it sounds dangerous doesn't mean it is. Magnesium Chloride(nigari) is perfectly safe. If someone eats too much it will be peed out, and any excess will act like Magnesium Sulfate, a laxative. Please actually research these things, the reason many dangerous chemicals have strange names is because they have not been used enough to get a common name. Every thing we eat has a name that sounds like it came from a laboratory, like Hydrogen dioxide(water), sodium bicarbonate(baking soda), and potassium bitartrate(cream of tarter). Hi, I use lemon juice to make the tofu curd. I works very well, like nagari, and has a very light fresh flavor, never bitter. Any taste is barely noticeable and not sour. Thanks a lot for the tutorial! De-bittering is one it's way, but the project already seems to be a success. I didn't have nigari at hand, so I first tried a cheese coagulant bought from a local pharmacy. It's based on Rhizomucor Miehei mushroom, and seems NOT to be working with soy milk. Fortunately I heard that apple vinegar would also do, and so it did. A cheese coagulant is of course either animal or vegetable rennet. Animal rennet comes from the stomach of the beast. I'm so impressed with your self-made tofu. As some others above, I'm still interested in your magic tools, especially that stainless steel mold. Where did you get that? jingjing, the tofu mold was bought at a great store in Tokyo (they also have stores in other cities) called Tokyu Hands, though some years ago so I don't know if they still have it. They probably have similar things though.Tokyu Hands is a must stop for any craft/diy/cooking fan. That stuff is worth it's weight in gold - It turns cotton fabric the whitest white - Have you got a perfectly white shirt that's sort of gotten gray or yellow from the wash - Soak it in the tofu whey before you wash it, and it comes out sparkling. Works for antique linens that cannot be abused with bleach, etc, too. Year's ago I obtained a book that explained how to make tofu, gave receipes, etc. But it also gave a history of tofu, and how it was made and used originally. The book explained how housewives would go to the tofu store to collect the whey, which the tofu makers did not want, to use for their laundry chores. Nothing wasted, how great is that? I had an infant at the time of my first attempt at tofu-making - I was using cloth diapers as opposed to the throw-away kind. (I'm was a subscriber to "Mother Earth News", after all) When I read about the whitening qualities of tofu whey, I just had to see for myself - Wow! Nothing I had bought off the store shelf worked better on those old cloth diapers - The whey, the sun, while hung to dry made them like new. I found something called nigari shio at my local Japanese food store in Seattle (Uwajimaya). Is this the same thing as nigari, or is it just salt with a bit of nigari flavoring? Nigari salt is just salt that is made from sea water and hasn't been super-refined, so still has some of the naturally occuring nigari in it. It's supposed to taste more complex. It can't really be substituted for purer nigari that's used as tofu coagulant though. I live in Chad and have a friend here who makes soy "fromage" (cheese) using lemon juice. It is crumbly and she adds some green onions and sells it in sandwiches. Do you think lemon juice would work to make tofu if I pressed it a bit? Re: Does lemon juice work? I have used lemon juice to make tofu. Someone wrote a cookbook many years ago that had this method. It tasted fine to me. Any kind of acid, like lemon juice, will coagulate soy milk (as it does cow's milk) but the results may not be quite tofu-like. You may want to give it a try though. I have tried citrus juice in a soy milk and soup mixture which forms a sort of curd-y liquid...it tastes interesting, especially if the soup has lots of flavor. Actually my question is about the whey. Seems like it must have some nutritional value. So much for concise directions! Sources for both gypsum and nigari and tofu molds can be purchased from this source: http://www.soymilkmaker.com/order.html. I haven't tried their nigari but the gypsum worked. I live just outside of NYC and have not been able to find powdered nigari at any of the Japanese markets around. Dear Maki, can the whey be used ? I should have tasted it when I made the tofu, but I got a bit excited and didn't. Do you use it or throw it out? Would it be used at all, traditionally? Thanks for you time. Some people believe that the whey has health benefits, and they either drink it or use it in soups etc. I personally am a bit skeptical about the health benefits...and to me it tastes pretty bad, salty and bitter, so I just throw it out. In olden days when salt and nigari were precious commodities, people would save the whey and use it to make the next batch of tofu. I believe the whey can be used with some salt to pickle veggies. Whey (not sure of the kind) is used to process saurkraut. Personally, I pickle my veggies in a Japanese pickle press using only a generous amount of salt. This makes them fresh and crisp even better than just raw. Perhaps someone can add more on this issue. Unlike some of the above lucky posters, my first attempt at tofu went miserably. Firstly, although I did divide my soybean mixture into two parts, in large stock pots, it still bubbled and foamed like a living thing, all over my stove, and continued to rise up and try to leap from the pot! Eventually, it boiled down to what looked like soymilk. After that, things went smoothly enough, I added a small amount of premixed liquid nigari and the curds separated, so I poured it into a cheesecloth mold and weighted it. But, the end result was inedible. It had a weird texture (kind of grainy and crumbly) the color was rather dark, and it was a little strong tasting even after soaking. I think my mold was too big for my batch so it turned out a little thin, and also I was wondering, if I add more nigari could that make it have a better, less grainy, texture? And, is homemade tofu usually a tan color rather than white? I make my homemade tofu with dark vinegar and bbrown rice vinegar. It has a brown color that look similar to beef and liver unlike regular tofu. I call it vegan tofu. I also mixed the tofu whey water with cransberry juice. It give you so much energy. I have many friends who love to eat it on their vegetmeatarian days. Hi, thanks for all the great information! We are going off-grid soon and we are looking for alternatives to electric appliances. All of the methods of making tofu I have seen so far require soaking the dried beans then putting them in a food processor, which we hope to eliminate. Do you know if handmill-ground dry soybeans can somehow be used with good results? If not, how was it done before electric food processors? I have never used ground soybeans for making soy milk, so I can't really say for sure. However, logically I think you would need to soak the beans in the water regardless, to extract the soy bean essence or whatever from the dry matter, whether whole beans or ground. Toasted and finely ground soybeans are eaten in Japan (it's called kinako) incidentally - mixed with sugar and used as a topping on various things, it's delicious. I'm interested in making my own tofu to avoid buying tofu made from soybeans of unknown origin. (mainly gmo) In Italy tofu is not really well known so the organic ones tend to be pretty pricey. Typing in "How to make tofu" into google directed me straight here. You mention you need WHITE soybeans. I have been able to find green soy beans (which we call mung), and yellow soybeans. Are the whites ones slightly yellowish? Do you think I have the right ones. Yes it's the dry white soy beans, which may be cream colored (mung beans are a different kind). How far will one go for tofu? I live in africa with no access to soy beans but we have soymilk here. Unfortunately, no tofu, hence looking up recipe online brought me here. I'm thinking about boiling seawater to get the salt and use it with store-bought soymilk. I'm gonna use milk carton and punches holes in it. Very interesting and promising project indeed. I will report back if it's a success. I seem to be one of many here having difficulty finding nigari. I have seen magnesium chloride in stores - isn't that essentially what nigari is? Also, when I used lemon juice, the tofu comes out pretty well. So in addition to gypsum and the various vinegars that people here have used, lemon juice seems to also work well. I believe you can either mix a 1/4 cup of lemon juice with a cup of water, or add the juice straight in, 2 tbsp at a time. On another note, Maki, do you make your own miso or natto (I know that the miso take several months, and you have to be very careful with natto to avoid food poisoning, but I'm curious if you've ever tried it. Thanks! I think magnesium chloride is essentially refined nigari, so you can try it. And yes any kind of acid will coagulate the protein, though you will get a little bit sour tasting tofu (even if you leech out the lemon). How much soymilk does the milk recipe make, which is then used for the tofu? I just used your recipe and had wonderful results! I used gypsum as I had some around. Thanks for the concise directions and helpful tips! I sadly made a mistake somewhere in the middle I think. I believe it will be edible but I certainly will have to be trying this again. A number of state highway departments throughout the United States have decreased the use of rock salt and sand on roadways and have increased the use of liquid magnesium chloride as a de-icer or anti-icer. Magnesium chloride is much less toxic to plant life surrounding highways and airports, and is less corrosive to concrete and steel (and other iron alloys) than sodium chloride. The liquid magnesium chloride is sprayed on dry pavement (tarmac) prior to precipitation or wet pavement prior to freezing temperatures in the winter months to prevent snow and ice from adhering and bonding to the roadway. The application of anti-icers is utilized in an effort to improve highway safety. Magnesium chloride is also sold in crystal form for household and business use to de-ice sidewalks and driveways. In these applications, the compound is applied after precipitation has fallen or ice has formed, instead of previously. Unfortunately that's not the only page that plagarizes this article, or other articles from Just Hungry. I don't really know what to do about it since take down requests etc. never seem to work. Hopefully people will be able to see which one is the original! i just want to ask if i can use soya bean powder instead of dried soya beans? and also, besides gypsum and nigari, what else can i use to make tofu? I absolutely love your sites (you are amazing, by the way) and I just found this article. I have been wanting to make my own tofu for some time now, so this really helps! Unfortunately, my husband just gags at the taste of regular soy milk and tofu, but he'll drink vanilla-flavored soy milk without too much trouble. Do you think that I could use flavored soy milk to make tofu so that my husband would eat it? Thanks. where can I buy a tofu box? 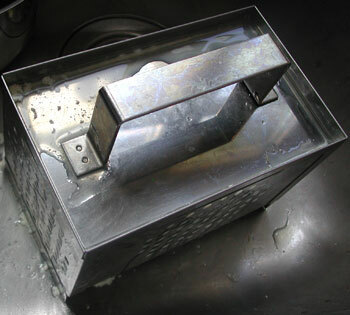 Hi Maki, I am currently living in Japan, and I would really like to buy a tofu making mold like the stainless steel box that you have pictured here. Do you have any advice about where I should look for one? Hi anhlukas. I got the nigari actually from a local tofu maker (in Hedingen), who sold us a big bag of the stuff for about 5 CHF which I still haven't run out of! Otherwise, you should be able to get magnesium chloride (which is what nigari is) from a pharmacy or Reformhaus. thank you very much Maki for your very prompt reply. I in fact have asked a number of Reformhaus but they do not have magnesium chloride either :( Do you mind giving me the address of a local tofu maker in Hedingen? I wish you a good evening. The tofu maker's web site is here: http://www.engel-tofu.ch/ Though I see you have found another source also! Have fun making tofu! It's a German website so everything is in German. But I guess with the help from Google language tools: http://www.google.com/language_tools?hl=en it'll make it easy for those who don't speak german. I got liquid nigari from my local Japanese market but I am unable to find out how much to use. Any help on what is thae ratio will be greatly appreciated. Liquid nigari is rather tricky to use - I suspect that there are just different strengths of it. What you have to do really is to add it little by little to the warm soy milk, stirring with each addition then waiting a bit, to see how much separation and coagulation you get. When it gets to the point where it looks like it does in the photo above then stop adding. You may want to note down how much you did add for later batches. Wow. Hello. 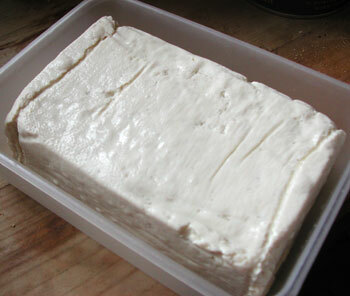 I just finished making mozzarrella cheese and have been thinking about doing the opposite... making tofu! And then I found this site! I love all the instruction. And I am going to be back to do this. Perhaps this weekend. This is just too choice. I wonder if I can get a tofu mold at Japan town in San Francisco? Wow,You explained it very well.Nice post.My mom used to do that also before.I have a lot of soya milk stocked on my freezer because first it was very healthy and taste so good!Good job. Hi Maki. You have inspired me to make my own tofu!My husband is a woodworker and he made me a press in about an hour! I went to 2 healthfood stores and neither of them had nigari. I got some epsom salt. Package says "magnesium sulfate", is this ok? Crazy that I could not find nigari. I live in the subures of Washington DC! I envy you your woodworker husband - I want one of those :D Yes epsom salts should work - it's what is used for Chinese style tofu which tends to be firmer than Japanese style. Maki-san! I have been eyeing off this series since you first posted it (yep, three and a half years), and finally got up the courage today to give it a try. I searched high and low for nigari, but couldn't find any, so I used a stoichiometric ratio of Epsom salts (I know) and table salt (I'm a chemist, which very occasionally comes in handy in real life.) Anyway, the tofu turned out beautifully. I'm so glad I tried it! Thanks so much for posting the recipe. I "accidently" skipped the first few steps and went right to the straining and molding and my tofu was great. See, I had purchased some soy milk at a big box store and it didn't all fit in my frig. I am used to storing those smaller cartons in my pantry with no problem so I put 1/2 galloon that didn't fit in the fridge into the pantry. A week later I noticed the carton was bulging, when I opened it - it had naturally cooked and separated! Strained, and had tofu..I was worried about souring but I guess I caught it at just the right time. Your sites are very helpful, thank you very much for your articles. But I've got a question - why do you think making silken tofu is not easy? Here in Russia we've got some problems with nigari - no one knows it. So we use good old lemon juice (or vinegar). Juice of half of the lemon is really enough for the milk made from 300 g dry beans (it may work well even with the whole 500-g pack, but I haven't tried). Then you put it into a muslin back and get your creamy tofu. And no bitterness! I have been making tofu for a few months and am excited and amazed by the versatility of this bean! Save the whey (yellow liquid). It not only cleans shirts as mentioned above... it can also cleans floors, and you, if you like. I just took a bath in some whey and it feels amazing. It helps to exfoliate, leaving your skin super soft. THNX for this tutorial :D it's great! But my tofu is grainy and soft. I removem enough water from it using metho you suggested. I followed the instructions carefully but maybe missed something. When I marinate it pieces fall apart. Where could I go wrong? Thnx again for the tutorial!! I believe gypsum makes a firmer tofu. I wonder if any other beans / legumes can be used, eg: lima beans, peanuts, etc (peanuts are a legume and not a true nut). There were several requests to learn to may tofu and your post was the first thing that popped into my mind! Thanks a lot for sharing this! I love tofu and trying to make one sounds really exciting! I just discovered your site. Have you seen that the LA Times last year did a story about a Japanese or Japanese-American tofu maker who has an alternative method for making tofu that does not require a tofu mold/drainer or weight. Just take the tofu solution and steam it or cook in a water bath as if it were a custard. I have nearly a pound of dried white soybeans and am soaking them. In several hours I'll decide which method to try. Thanks for this post. It really inspired me to try to make tofu at home. Question : does the milk have to be warm? I'd like to try making tofu out of raw hempmilk and I don't want to hit it to high above body temperature... What do you think? Grr, that page has copied my post without any attribution or permission. This is the original! I really can't comment on hemp milk since I have no experience with it, and I'd just be guessing wildly. I have failed to get the milk to become curds 2 times(but I refuse to give up). I'm using a SoyQuick maker and it looks and tastes ok but even with 5 tps. of nigari nothing much happens!!?? I have finally made some good tofu, but I want to make firm and extra firm tofu as well, but can't find a source for calcium sulfate. Can I make firm tofu with nigari? Can anyone direct me where I can get food grade calcium sulfate? I am finding that the cloth that I use to squeeze the curd with loads up with "soy glue" after a while, do you know what will remove the glue? or do I have to throw the cloth out? The soy curds are mostly protein, so you need to wash the cloth out in cold, not hot water or the protein will clog up the cloth. Thanks so much for that vinegar tip! My soy milk is definitely okay for making tofu then! I figured there must be something wrong with my nigari-adding process. Quick question. After my initial adding of the nigari, and after waiting 15 minutes, if I need more nigari, should I heat the mixture back up to the 75 degrees C? Please ignore my question, it turns out my soymilk making process was the problem. I now have yummy tofu! GF, dairy-free, sugar-free and frugal! 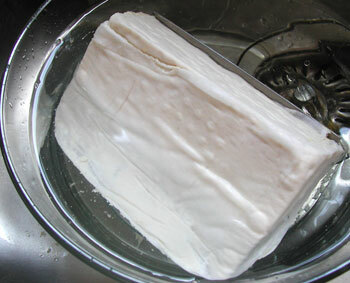 For a homemade container for making square tofu, may I suggest using plastic containers usually used for storing goods. Try and find one that's a bit deep. Drill, or use something else, to make holes. Be careful to make holes far enough apart to ensure stability of the container. Clean carefully after wards and get rid of any plastic that is left from the making of the holes. The lid can be fastened out of a piece of plastic smaller than the container. Just press it into the container when removing water from the tofu. Hope this helps those who were unable to find the proper equipment in their area or those that are on budget. For those of you willing to spend a little extra, Google tofu press and quite a few options come up. where can I get gypsum in Switzerland? I've been looking all over (or at least it feels like it) and just can't find it - getting really desperate. You should ask at a pharmacy, or health food store (Reformhaus) - they may not have it in stock but can order it for you. Use the chemical name that I wrote in the article. Hope that helps! I have never tried making tofu from powdered soy milk. Chemically, it should be possible. However, I wonder if it's worth the effort taste wise. The whole point of making ones own tofu is for the fresh, wonderful taste, and using dehydrated powder seems to go against that. Hi, I've made tofu today for the first time. I used 300g soy beans, according to the recipe written on the nigari pack. Although everything seemd to go smooth, I ended up with very little tofu, about the half amount I was expecting (I have a box which should accomodate aprox 2丁(cho) and ended up with about 1丁). I have no idea what caused this. Does anyone know what factors influence the amount of tofu? Is it the water, the soy beans, the amount of nigari? Any suggestions would be much appreciated. Your situation sounds just like my current experiences with making tofu. Did you use liquid nigari? Did it come in a package with your tofu mold? I am using a liquid nigari that comes in individual clear packets. The Mitoko Home Tofu Kit that I purchased came with a nice wooden mold, two cheese cloths, and a dozen individual packets of liquid nigari. I've made 5 attempts at making tofu, and followed the instructions to increasingly accurate procedure each time. And yet, my yields have all been very small; maybe a centimeter tall! I'm going to try using dry nigari and dry gypsum next and see if my liquid nigari is the cause of this issue. If you discovered the problem you were having, I'd be most grateful to hear more about your experience. Thanks. Sorry to bother but I saw this guide on another home page without any reference to you or your page, and since they linked everything to china it seems a bit suspicious. Thanks for pointing it out. That plagiarizing site (I took out the link to it, to prevent people from finding it) has been notified more than once about their theft, but they have chosen to ignore it. Some people have no ethics. And in case people think I'm being anti-Chinese, that site is supposedly produced by an American. On another, more positive note, I hope you are doing well, that your health is stabilized, and that every day brings you happiness. You certainly know how to brighten mine by feeding my soul with your writing and your recipes. 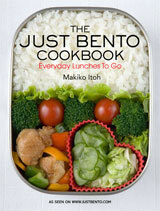 I can't wait to receive the Just Bento Cookbook that I ordered! I made tofu with lemon juice (fresh) and it turned out very good. I will try with white vinegar next time. I understand that gypson is not good for your liver at a long run. About the mold, I used the Country Rich ice cream containers (one gallon and one pint - 4.25L). I bought this ice cream at Sam's Club but I saw that Walmart sell ice cream in plastic containers also. It is a square container and the top part is bigger than the bottom part so one can go inside the other easily. I heated a round metal stick over the kitchen fire (we use gas) until it becomes very hot and punched holes at the bottom and around one box. After I wrapped the tofu with the cheese cloth or a piece of thin cloth I filled water in the other container and put it on top of the tofu. After 20 or 25 minutes, I turned the container upside down and the tofu in the wrapped cloth slided out very easily. Thank you for the fantastic instructions. I have made soymilk before but not tofu. I used gypsum instead of nigari because I found it a local shop. Is it normal to have more okara than tofu at the end? I made two batches, and this was the result both times. Also, I noticed a big difference in tofu flavor depending on the type of soybean. The "Laura beans" make a much milder tofu! My daughter thought it was as bland as noodles. Have you used different types of beans and if so, where do you buy them? I have been making tofu for the past few weeks. I purchased off ebay a paneer mould. Ok it is round, but it does the job beautifully. I use my tofu half and half anyway for savoury and desserts. Re: the whey. It does indeed make a very good job of washing your whites. I followed the instructions and have ended up with an absolutely pathetic amount of tofu, which is extremely firm after only a few minutes of pressing. I also have LOADS of okara (4-5 times more of it than the tofu), and a lot of whey. Is there a way of getting a larger amount of slightly softer tofu? Did I add too much coagulant (I was using powdered gypsum)? Not enough water? Not cook it for long enough? I noticed that the water that I soaked the soybeans in overnight had turned quite "beany", so I added it to soup. Is it usual to use this water? Have you tried making black sesame tofu? Can you freeze your tofu to make it last longer? Freezing tofu changes the texture. It is great to make eggless egg salad. I think you can find this recipe on the web. Caked, frozen and fried it is delicious. I never succeeded in making tofu - but your guide is realy great - I think now I will make it! Thank you very much! Please tell me, please, how many lb of tofu will come out from 1 lb of dried soybean. Thank you very much!!! i like soya and tofu but i've just made soya. and wonder how to make tofu! luckily read this receipe, i will make it soon. wish me success! Can the tofu be frozen? My son likes the texture if store bought frozen tofu and I was wondering does homemade tofu get that same texture? It guess it depends on which type of store-bought tofu you usually freeze, and what you cook with it. If you want to make a fresh version of the dried frozen tofu (the one that has the texture of a sponge after being rehydrated and that's used in classic buddhist cuisine), the Japanese recipes I've seen (incl. the one I've tried, from E. Andoh's Kansha) all call for using silken tofu, not firm (not even the Japanese type of Maki's recipe, much less the firmer chinese types) - but she doesn't say why. Andoh advises using store-bought silken tofu over the homemade silken tofu too (I use a vaccuum packed Japanese brand like Mori-nu for this). No doubt the texture would be different using fairly soft homemade momen tofu (It's hard to guess how it would be once thawed, but I get the bad feeling it might crumble/fall apart during the squeezing/draining process), but I think the main reasons to favor store-bought tofu to freeze and thaw are that it's more convenient (it's all done in the packaging) and also safer (ie: homemade tofu is fairly fragile and without preservatives - and homemade frozen tofu also spoils fast - might not be the best idea to thaw it slowly over 48 hours - while store-bought tofu remains sealed during freezing, thawing and until you're ready to drain it and cook with it) and possibly because the difference in taste is not significant enough in the end (especially after seasonning) to worth all the effort of using homemade tofu for this, especially not silken tofu. I haven't made tofu for many years but am going to start again. When I was into making my own,I did lots of experiments with different substances. What I discovered is that a curd product can be made with most legumes and some nut milks. Some are better than others and different curdling agents work best with various milks.I presoaked soybeans till partly soft (a couple of hours) and then ground them with water into a slurry before cooking them,which speeded up the cooking time a lot. 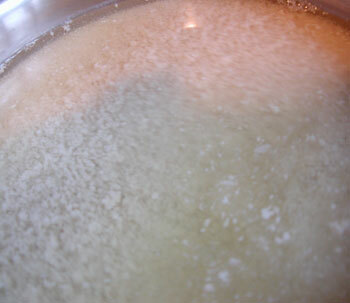 then after straining the milk reheated to close to 180 degrees F and lower the heat way down .Then drizzle part of the Nigari water over a the back of a wooden spoon across the surface of the milk stir lightly and wait for a while the clouds form.Then sprinkle more of the Nigari .Continue this till the whey is clear yellow .The key is to be gentle with the curds. then continue as you said. I have a wooden form and use muslin to drain. the resulting Tofu lightly pressed is like custard and tastes better than any Commercial silken I've ever had. I made Peanut Curd with lemon juice and it came out like small curd cottage cheese with a delightful flavor. BTW the old Japanese said that there was a quality they called GO that varied among different beans and the higher the GO the better the Tofu. Leo: I have often wondered if other beans/legumes could be made into a Tofu-like food. You've given me the confidence to give it a whirl with black beans!!! Thanks for posting. When I make the tofu, I seem to continuously make something that is not curds, but actually extremely fine little particles. When I strain this through a filter, I get some slimy stuff that is more like soy paste, and only get a tiny container for 3L of soymilk. What I want is a large lump of firm tofu. What did i do wrong. Its separated allright, but why does it disintegrate into fine silt instead of firmish curds? Have I added too much coagulant perhaps? Two things that can cause those grainy bits of curd are 1. using too much coagulant, or 2. using soybeans that are too old. Try adding the coagulant in batches, stirring constantly, until it looks like eggdrop soup. Drain off some of the liquid from the curd and see if the curd looks like the photo above after draining (the 5th photo). If so you're all good. Can see that the process of making tofu is similar to making cheese which I have experienced in Korea. Anyway it maybe unrelated but do you know how to make Tau Kwa/ Tau Kua Malacca style. Have you tried them? It's small and squarish and has some smoky taste which I like a lot. Malacca is too far for me as I'm in Penang now so just wondering whether you might know how to make them. Can't find a tau kwa recipe online. Thanks. Today I managed to make the soy milk and the tofu, thanks to your excellent site and marvellous instructions!! I was too excited to read to the end and didn't realise that I should wash the tofu in water, but as I had used lemon juice as a coagulent it still tasted amazingly good to me; plus, I have loads of wonderful okara to make yummy cake & stuff with!! Thank you soo much, I was about to give up, your site is great, thanks heaps! Just a heads up. The Rakuten seller does ship to the US. In fact, the press is currently on sale for about Y1700, so ~$20 + shipping. I ordered it with Rakuten EMS shipping and the grand total came to about $50 USD shipped. It took roughly a week end-to-end. You will likely have to sign for it or pick it up at your post office due to the customs forms. Yesterday I paid to Rakuten US$61.95 (5.700 JPY)for the tofu mold/presser. I'm satisfied with this vendor in Japan because the transaction was done very quickly and smoothly. Now will see how long it will take to arrive at my post office. OK I have in my hands the tofu mold/presser and the size of the box is the same as the plastic tubs you buy the tofu at the store... I thought it was bigger but the quality is very good. For those in far-flung places who have difficulty getting nigari, lemon/lime juice would work as well, or the various vinegars. Gypsum is available in most A&E depts as Plaster of Paris! Locally (Crete), the pharmacists appear not to know of Magnesium Chloride nor even Magnesium Sulphate - even writing out the chemical formula foxed them. And talking of foxes - deep fried tofu!! What is the preservative you can recommend for the soya milk shelf life longer than 3 day? Would you recommend stpp sodium tripolyphosphate as a preservative? What is the measurement needed vs. soya milk. I used to hate tofu. I found this site when I wanted to try making soy milk. A couple months later I decided to try making tofu to see if homemade is better than store bought. I couldn't find nigari so I used gypsum instead. I'm glad I tried it because now I have tofu almost every day. It's not hard to make and it tastes awesome. Thank you so much for posting these instructions. I work in a homebrew store (for homemade beers and wines) we sell Gypsum as people use it to adjust their water. For those of you looking for gypsum there might be a homebrewing shop in your area. I think it is useful to mention that I buy most of my organic Japanese food products online from Natural Import Company. They have Nigari and live miso. I use their hatcho miso to make oat milk. They also have low salt miso. They have the pickle press too. They have a wide range of organic foods and other products. They are in the USA so those who live in the US can have their products easily shipped to them. I receive mine in just a few days. They are very prompt. Thanks you for the great tofu making demo. I had been using gypsum as coagulant for the past 6 months but got to try nigari today and my tofu is sitting in my sink draining as I write. I had been having trouble getting big curds to form and thanks to you I now know that I just needed to add more coagulant. Is it just me but is cleaning the muslin cloths quite difficult? I don't use regular detergent as the perfume would spoil my tofu so I would love to hear what you use to clean your cloths? Also, I only cook the blended beans for about 5 minutes before straining them as per Andrea Nguyen's book. Am I missing out on flavour etc by doing this? Thanks Maki and hope you get to answer my questions. I was lucky to find the address of the Japanese supplier for the Tofu Press here.The price is very good and the quality is really excellent, making it a BEST BUY in any language. Today made my first batch of tofu using this press,its great. Started out with 400 grams of dry soy beans which yielded 586 grams of tofu after drainage and pressing. Perfect for the volume of the press. Would you know where I can find powdered nigari in Japan? I have managed only to find the liquid kind, at a small shop where they specialize in fresh tofu. Also, I was wondering if you have heard of soy allergies. I seem to do fine with fresh tofu and natto - but koyadofu, soy milk and okara give me a slight itch and burning in the mouth immediately upon tasting. I am wondering if this reaction is to one part of the bean - or is it just when it is raw? what do these products share that tofu and natto don't have? Perhaps you know? You can get powdered nigari online (Amazon, Rakuten etc) or you may be able to get it at a pharmacy. Re: soy allergies, yes I I think some people have soy allergies but I'm not a doctor so I can't say more than that. You should get tested...soy allergies are known in Japan (it's one of the common allergic foods listed on food packaging). Regarding your comment that the home made tofu is different every time, I love that most about home cooking most of all! There is nothing (in my opinion) more boring than having shop bought foodstuff and it being predictably exactly the same every time! I've been a keen home cook for years now, but I've only just discovered the delights of making home made soya milk and tofu. I've made all of the mistakes possible, and all of them have been valuable (if not sometimes a bit white knuckle) lessons. Your 'milking the bean' blog has been really helpful and informative - thank you very much - diolch yn fawr! I just tried making tofu today, and just using lemon juice as coagulant, unfortunately the result is not too good, the tofu is too soft so when I put it in cold water it just broke into small pieces, can you tell me what I did wrong ? thank you. Yes that's what I stated in the article, although for what it's worth, when I have made tofu recently I have used 2 smaller containers (just plastic boxes with lots of small holes poked through them with a drill) instead.